In addition to the improved sound quality, the look of “big sound” has been redefined throughout the line with sophisticated cabinetry, refreshed logos and rounded feet. Tower speakers for serious listeners with a 1" titanium horn-loaded tweeter & dual 8" high-output woofers. Barely used because I do not have enough room for them. Just like new. FINISHES: Black Ash & Cherry woodgrain vinyl. The RF-52 II is complete with our proprietary Tractrix® Horn technology which produces a unique combination of precision, clarity and effortless power. Awesome KLIPSCH RF15, 3-Way Floor/ Tower Speakers RF-15 - Pro Reconditioned. This thing is a beauty. Very solid and highly collectible. Klipsch RF-82 II Black (Pair) Floorstanding Speakers. Adult owned and were rarely used. I’m the original owner and bought new. Have been in storage and in great condition. Local pick up only. Trending at $2,112.50eBay determines this price through a machine learned model of the product's sale prices within the last 90 days. This thing is in great condtion. Rated at 225 watts. Missing Grill covers. Very solid and highly collectible. (No Grill Cover). Klipsch Reference Series RF-42 ll Floor Standing Speakers - Black Ash. Really good Condition not scuff or anything at all. Front grill is near mint condition. Due to size there is an extended handling time of 4 days but could ship out sooner. Shipped with UPS Ground. Grills are not original. "Toes" for footing are not included. You receive what in the photos. S/N RF3BK 00100238 and 001130456. Beautiful cabinets. near mint, only issue I see is one rear upper corner, as seen in a picture. 1 pair available. Marinette, WI. 2 Speakers Included, NO Accessories. Klipsch Reference Series RF-42 ll Floor Standing Speaker - Black Ash. Condition is used but in great working condition.no scratch’s scuffs or blemishes anywhere.work flawlessly. Just looking to sell to upgrade.thanks for looking! Klipsch RF-35 K-1122-OB / #120860 8" woofer Excellent Condition . Both speakers have been fully tested and sound great. These are top of the line speakers that produce amazing sound quality. Speakers and are in EXCELLENT CONDITION, besides a few scuff marks. Speaker System Type: left / right channel speakers. Condition is Used. Local pickup only. They get loud easily and cleanly without needing monster amplification. They are in superb condition, having only one tiny scrape (which I repaired with a black marker) on the edge of one speaker. Part Number:#116435. Capacitors, Coils are good shape - No visible cracks and dents. Reference Series Tower Speaker. Front Cover Plate Only. X2 Adjustable Height feet screw. We all make mistakes don't we?. Quantity: 2EA (Left & Right). Synergy F-2. Synergy F-3. and others. Whether you enjoy playing video games or jamming out to your favorite tunes, the quality of sound you hear is highly essential. Klipsch features many different types of speakers designed to fit your style and sound preference. On eBay, there are many types of Klipsch RF speakers to choose from, which is why it is critical that you find one that is suited for your needs. What types of Klipsch RF speakers are there? 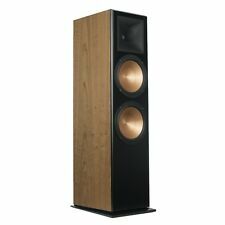 Klipsch RF-7 Mark III Reference Tower Speakers - This RF-7 speaker is available in cherry and walnut. It features a titanium compression driver and 90x90 compressed molded-rubber Tractrix horn for stable sounds along with cast basket Cerametallic woofers. Klipsch RF-82 II Reference Floor Standing Speakers - The RF-82 speaker is available in black ash. It features dual 8-inch woofers which provide superior sound, bass, and minimum sonic distortion. Klipsch RF-3 Reference Floor Standing Speakers - The RF-3 speaker is available in black. It features both a tweeter driver and woofer driver for optimal bass and sound. Klipsch RF-52 Reference Floor Standing Speakers - The RF-52 speaker is available in a black wood grain finish. It features dual woofers so that there is minimal sound distortion along with a horn-loaded tweeter. What devices are compatible with Klipsch RF speakers? Klipsch RF speakers are compatible with just about any sound-producing device. For instance, you could connect your Klipsch RF speakers to your computer if you enjoy playing computer games at full volume. You could also set up your Klipsch speakers to your TV to watch a movie, play video games, or listen to music. How do you find the right Klipsch RF speaker? When determining which Klipsch speaker is right for you, it is essential to figure out what you intend to use it for such as listening to music or playing video games. RF speakers offer different size dual woofers that can provide more sound. If you are someone who enjoys listening to audio loudly, you may want to opt for larger woofers. You also want to figure out how much space you will be working with as some RF speakers take up more space than others. If you live in a small area, you may want to opt for a speaker that is smaller than the rest. Many affordable options are available on eBay. Content provided for informational purposes only. eBay is not affiliated with or endorsed by Klipsch.